New software and e-ink and tablets, oh my! Could this be the Kindle Paperwhite competitor the world's been asking for? 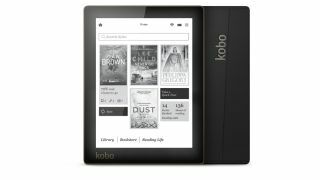 Kobo has gone hard with the specs of its top-end devices, readying itself for a war with Amazon and its Kindle Fire HD 2 by unleashing the Kobo Arc 10HD, as well as the Arc 7 and 7HD - plus a cheeky new update to its ereader range with the new Aura too. The two HD tablets, the Arc 7HD and 10HD, are powered by Nvidia Tegra chipsets, with a Tegra 4 1.8GHz quad core running the Arc 10HD and a Tegra 3 1.7GHz quad core for the Arc 7HD. These are designed to take on the power of Google's Nexii range, with the 10HD in particular catching the eye. With a 2560 x 1600 display with 1080p video playback, a 1.3MP front facing camera, 802.11 Wi-Fi, Bluetooth 4.0 and Miracast support, combined with the uprated processor, the 10HD looks set to offer high quality pictures at a speed that could rival the Sony Xperia Tablet Z. And the best part? It will only cost £299.99 ($US399.99 / AUD$499.95). The Arc 7HD will come in two flavours - 16GB and 32GB - and will have a new Nexus 7-rivalling screen with a 1920x1200 resolution screen and runs an Nvidia Tegra 3 1.7GHz quad-core processor and houses 1GB of RAM. It's also got a 1.3MP front-facing camera, and for the princely sum of £159.99 (US$199.99 / AUD$249.95) for the 16GB and £189.99 (US$249.99 / AUD$299.95)) if you opt for 32GB, we can see this being an option come the Christmas period. The Arc 7 is an entry-level tablet with a 1024 x 600 screen, 8GB of storage and a compact body, runs a MTK 8125 1.2GHz quad-core processor with 1GB of RAM. It's got a more bargain-basement price, set to cost only £119.99 ($US149.99 / AUD$199.95), but it's hard to see how you couldn't convince yourself to not buy a couple of rounds at the bar and get the much more nifty 7HD instead. All three run the 4.2.2 version of Android for complete access to the Google Play store. And then there's the new Kobo Aura ereader,a 6-inch device that has been given a big boost in terms of resolution (now up to 212DPI, which Kobo tells us closer than ever to the 300DPI that's needed to mimic a printed book) and features flicker-free technology, which means page refreshes (where the screen flashes while the e-ink rejigs itself) now only needs to happen every chapter. The front-lit ereader has an edge-to-edge display for improved aesthetics and comes with 4GB of onboard storage plus a microSD card slot. It joins the recently released Kobo Aura HD as a more affordable, slightly smaller ereader, with a price set at £119.99, $US149.99 and AUD$189.95, with a variety of colours on offer. Of course, Android tablets are breeding faster than rabbits these days, so it's no surprise Kobo has smothered the Arc lineup in its own skin as a point of difference. Dubbed Reading Life, the user interface of the new tablets is designed to showcase the Reader's recent activity, alongside personalised recommendations.A dedicated reading mode also helps remove unwanted distractions like email alerts and notifications, while dimming the screen to boost battery life. Kobo has also integrated Beyond the Book, a way for readers to get more from the titles they read through integration with services like Facebook and Pocket, as well as delivering stats and awards and offering a variety of fonts. What's more, the Pocket functionality will also be integrated with the Aura, allowing users to read any article from the web on their e-ink device whenever they want. Parents concerned about their children's reading habits will also have cause to celebrate with the introduction of a new Kids Store, which includes over 100,000 titles and gives parents the ability to control spending, adjust search settings and pre-select titles. It also offers the ability to set reading goals, and track progress through a variety of reading statistics. Initially, the Kids Store will roll out in September to North America, United Kingdom, France, and Italy, before being rolled out to the rest of the world. The Kobo Aura sounds good, but how does it compare to the Amazon Kindle Paperwhite?